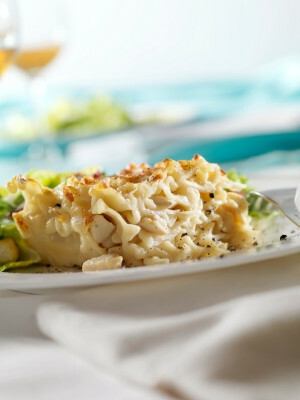 This is the best recipe for Seafood Lasagna. It produces pan of heaven that is creamy, rich and full of flavor. Offering many authentic Italian recipes from scratch for you to try and call your own. Start a family tradition today. lasagna noodles, ricotta cheese mixture, seafood mixture and top with some of the shredded cheese. Repeat layers until all of the ingredients are used. SAVE 1/2 OF THE SHREDDED CHEESE FOR THE TOPPING. Bake, uncovered, for 45 minutes. Cover with foil and bake another 15-20 minutes.